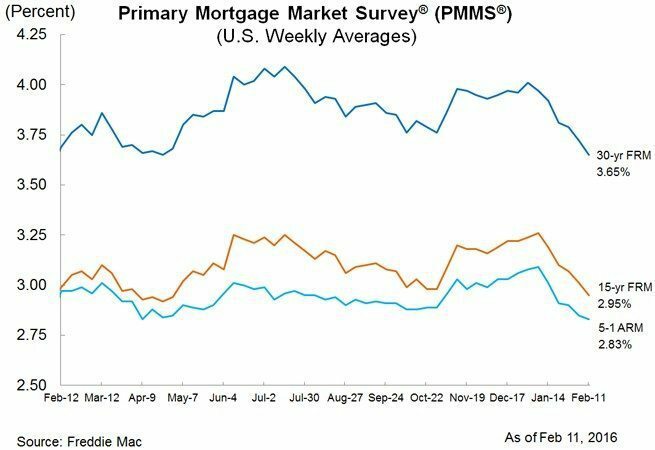 Mortgage applications for new home purchases increased 14 percent month-over-month (not seasonally adjusted). Conventional loans comprised 67.4 percent of loan applications, and FHA comprised 19.5 percent. The seasonally adjusted annual rate for single-family home sales was 499,000 units. The 30-year fixed-rate mortgage averaged 3.65 percent with an average 0.5 point for the week ending February 11, 2016. This is down from 3.72 percent last week. It’s also slightly down from 3.69 percent last year. The median existing single-family home price increased in 81 percent of measured markets. 34 areas (19 percent) recorded lower median prices than a year ago. An average of 89 percent of measured metro areas saw increasing home prices in 2015.